Vivyne Andrano is a Dunmer commoner located on the Waistworks level of Vivec's St. Delyn canton. She is wearing a common shirt with matching skirt and shoes. Aside from her natural resistance to fire and the sanctuary provided by her ancestors, she knows no spells. She is a Sleeper under the influence of Dagoth Hlevul. Speaking to her after she has been cured from the spell will net you 1 Reputation point. 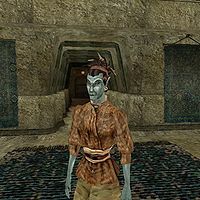 When asked about latest rumors, she will tell you: "I've heard of a cult of Daedra worshippers right here in Vivec. Somewhere in the St. Delyn Canton." This page was last modified on 7 September 2013, at 17:43.